We’ve all worked in an office where we’ve suffered from an occasional problem with noise or temperature. Whether the builders are in to fix the security alarm, or the air conditioning can’t cope on a hot summer day, office tempers fray easily when workers don’t feel comfortable in their own surroundings. So when do a few bangs and a bit of drilling turn into a real employment issue, and when is hot too hot or cold too cold? We take a look at current legislation designed to keep you happy and healthy in your workplace. Heat stress can be a real problem, particularly for those based in an industrial environment where work is manual in nature. A workplace that is too warm can cause a range of unpleasant symptoms for employees, from headaches, fainting to delusions in severe cases. Even in mild cases there is likely to be a marked drop in productivity and the Health and Safety Executive recommends carrying out risk assessments in such environments to ensure that any heat-related problems can be addressed before serious complications occur. If you’ve shivered your way through a working day you’ll realise how being too cold can impact your productivity, mood and morale. Legislation dictates that the minimum temperature in a workspace should be sixteen degrees Celsius, though the actual temperature will depend on the movement of air around the space. We’ve all found ourselves at a desk under the air conditioning at some point, and know how chilling cold air can be when it blows directly upon you. Any discomfort caused from the heating system in your workplace should be reported to the department in charge of facilities. The chances are that a few quick tweaks will have the temperature feeling much more pleasant. 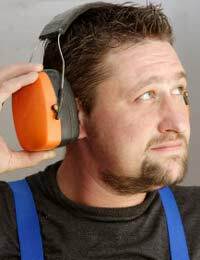 As well as being annoying and distracting, loud noise in the workplace can have a severe effect on your hearing, even if only temporary, meaning you may miss important warnings. If you’ve received communications from your employer warning that noisy work is imminent, it’s not because your bosses are being simply considerate. Employers are obliged to let workers know if noise levels will rise above eighty five decibels over an eight hour day. In addition, workers must be made aware of any risks to health posed by excessive noise, and hearing protection must be provided. Beyond ninety decibels, employers must provide appropriate signage, hearing protection and monitor the health of employees. The first step in tackling a noisy workplace is to request that your employer conducts a risk assessment to determine whether or not the volume warrants any of the actions outlined above. Given that a normal conversation won’t be louder than around sixty decibels, if you’re struggling to communicate with employees without shouting; it’s time to demand action. If you’re too hot, too cold or too distracted by noise to be comfortable in your work environment, don’t hesitate to raise the issue with your employer. Without action, at the very least you’ll be unhappy and you productivity will suffer, and if the worst happens your health could be seriously affected. Don’t be afraid to speak up!